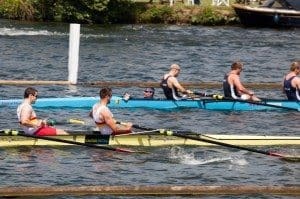 Henley Royal Regatta kicks off today, full of promise for what looks like an unforgettable 5 days worth of rowing action. Whether your a follower of racing or going along to soak up the ‘Edwardian garden party ambience’ there’s sure to be plenty enough going on! The weather forecast for Henley is fantastic with plenty of sun necessitating the boater hat Henley has become famous for and (hopefully) not a drop of rain predicted. Perfect weather for our guests in the River Lounge to enjoy their breakfast canapés and Champagne! For the racing enthusiasts however the Regatta is full of excitement and promise with débuts, comebacks, rivalries and what will be an emotional appearance from Sir Steve Redgrave, winner of 5 Olympic gold medals as well as 9 World Championships gold medals. Redgrave’s former Olympic and World Championships team mate Andy Holmes tragically died last last October from a water borne infection. Steve will substitute for Andy in a row-past on Friday by the Kingston coxed four who won at Henley 30 years ago. Thursday will see three time Olympic champion Drew Ginn make his international return after two years with a new crew with whom he’ll be hoping to become Australia’s most successful oarsman next year at the Olympics. The Australia foursome will likely benefit from the experience Ginn brings to the crew and they’ll definitely be one to watch this week and in the future. This years Regatta will feature no less than 9 American crews including men’s double sculls, men’s and women’s quadruple sculls, men’s pair, men’s four, and men’s and women’s eights. Of particular note is on Friday where the Olympic and World Champions women’s eight crew will be competing. Another eagerly anticipated comeback is to be made by Jamie Koven who retired after a serious back injury. Koven came back to racing in 2010 and US fans will be hoping to see the two-time World Champion find some of his past form. Perhaps most exciting is the men’s quadruple for the Queen Mother Challenge Cup which will see the US crew compete with Olympic champions Poland, World champions Croatia and World championship finalists Great Britain and Australia. The quarter finals for the Queen Mother Challenge Cup start this Friday. 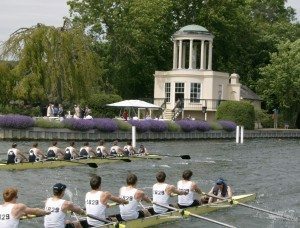 This years Henley Regatta is a prime opportunity for spectators to see watch Olympic and World champions with some of the worlds best crews as they prepare and tune-up for the upcoming World Championships in Slovenia and of course the London Olympics next year. Combine this with some of the finest, most luxurious hospitality at any social or sporting event and we have a truly exciting Regatta for all our guests this year!